(Newser) – Mike Grocott's resume may seem at odds with itself at first glance: The Brit is a professor of anesthesia and what Americans would call ICU-related medicine, and he also heads up Xtreme Everest, which has essentially put a lab higher than any other on Earth to study how oxygen-light altitudes impact the human body. But the two actually go hand in hand, Richard Benson explains in Wired UK. 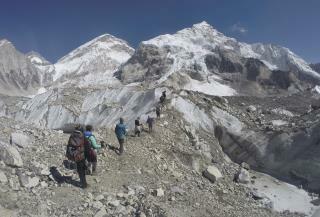 What Grocott is doing on Everest actually "has relevance to the way we treat the very sick in intensive care." Benson explains that not enough oxygen getting to one's vital organs is actually what most kills ICU patients. And as Grocott's research has shown, health and fitness aren't what determine human oxygen efficiency. "Xtreme Everest has taken 70-year-old civilians up the mountain with no problems, but fit, young military personnel have had to turn back," Benson writes. They should also check method of inhaling. Through the mouth, not enough oxygen to muscles. Through the nose, enough oxygen to muscles.